Forum Index > Off-topic Talk > Use of zweihanders? Bill/Patrick, Good to see folks working with Figueiredo, one of the reasons we didn't put interpretations into our PDF is we wanted others to have the leeway Dom Diogo allows us. Having a big trainer is just necessary to get the full benefits of the insights this, and the spa done material provides to your fundamentals for all weapons. Here we too have been playing around with variations to the basic rules, also doing sillier things from the Italian material, and working with the masters material - Monte, Anon 1580, de Paredes, Godinho, de Viedma. The Godinho translation is complete, but unpolished, it could still be a while. Patrick, I look at driving and fight before and behind as transitional between the two. Wait till you see Godinho, his effectively only situational, and with a different palate of direction change steps that is far more dynamic and risky than Figueiredo's. Woo Hoo! This is exactly the sort of conversation that Steve and I hoped to start seeing more of when we made the translation available Bill and Patrick, your analyses of the work are particularly enjoyable to read. As Steve said, we purposely kept the interpretation out of that publication, but now I want to join in the conversation, so I'll chime in with a couple thoughts I've had on some of the topics you've brought up. Sorry I'm late to the conversation. Regarding stepping or not with cuts: The more power you want in your cut, the more you need to step. Most cuts without steps are dispositive rather than executive. Stepping also helps when changing direction and cutting at (approximately) the same time. I do 2c with the same footwork Bill describes, but I think it is interesting that 2s is all cuts with steps, and the implication is that 2c is more difficult, perhaps because of that very lack of core body movement to assist the cuts, again in line with Bill's comments. Thrusting without steps: IIRC, all thrusts from the right shoulder are with a step, and these all make sense. The thrusts over the arms are often with no step, and we have found a couple reasons to consider for this, which aren't in the work itself. First, all other authors tell you not to thrust when facing multiple opponents, since a thrust offends one but a cut can offend many. You can do most of the rules by just leaving out the thrusts, or by sliding them from/into the cuts before/after. Second, Monte describes cutting with a step and slipping the point backwards to elude the parry, and then thrusting. This works great :-) Monte is doing it with rising cuts, but it is essentially the same thing Timo described with a descending cut. Cuts to or through the centre: I try to use both of these, because no system is complete without both. Circular cuts are described a lot in period works, but the leverage of two hands let's you do things like disarm a single hand sword using your weak against their strong. How can you not love that? I choose to or through mostly based on what is happening next: if it's followed by a thrust, the cut is to the centre (though Matt Galas does a pretty convincing tight continuation of a circular cut to return the point towards the opponent); if you want to cleave the opponent in twain or force him to step the f*** backwards, it's a cut through the centre; any time you want to affect more than one opponent with a single cut, it's a cut through the centre. The importance of using a realistic trainer: There's all kinds of montante stuff you can do with a longsword, but which if you try to do the same thing at speed with a realistic trainer your body will let you know the following morning in no uncertain terms that that was the wrong way to do it. Glad to see you here Eric, and yes, just the reason. Although it is interesting to see everyone starting to go in similar directions. I think the reason there is little cutting through the center until late, is that the plays are evolutionary for the tyro, learning the teaming of sword and body as discussed in the avisos. 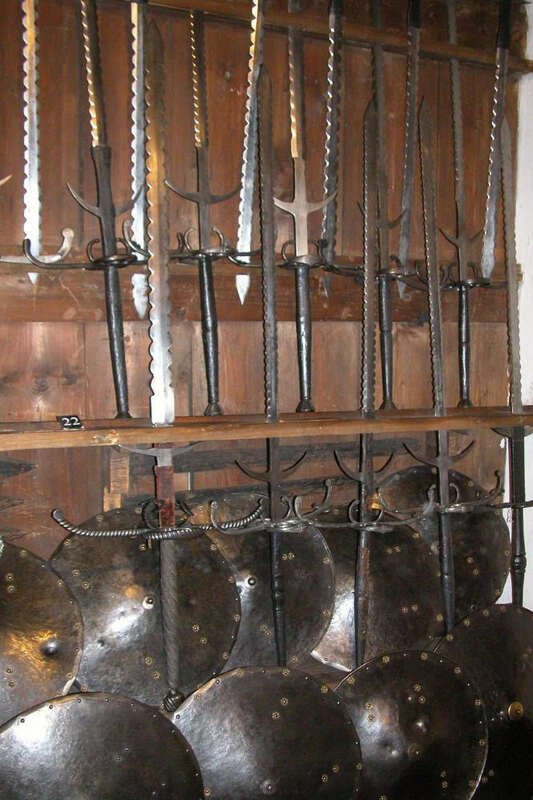 Different sorts of uses, these swords were used for specialized troops. From the introduction to our translation and transcription, I recommend the entire introduction to address this issue, when discussing the use of the large two handed sword by Iberians. or for clearing space [in a crowd]”xii. I'm affraid there is little support for that description in primary sources written in the 16th Century, the Zweihander wielding Doppelsöldner is to a very larg extent the invention of 19th and 20th Centuries. In the German military texts the doppelsöldner is first and foremost an armoured pikeman. For example the "Trewer rath" from 1537 "...the Doppel-sölder, that is the armoured pike..."
By the time the scribe of Daniel Rantzau was writing a war diary of the campaign of 1567-1568 the word "doppelsöldner" had become another name for an armoured pikeman. The landsknechts in Danish service havign doppelsöldner, men with "short weapons" (i.e halberds) and men with firearms. It seem that the unarmored or lightly armoured "mittelsöldner" & "gemein söldner" pikemen had been converted to arquebusiers who were far more usefull in the broken Swedish terrain. Only the well equipped and experience armoured doppelsöldner retained the pike. Each 400 man "fähnlein" of Landsknechts were to have 100 "fully harnessed" pikemen armed with pistols(!) (50 of these were to be doppelsöldner), 50 men with two-handed swords or other good polearms such as halberds also armed with pistols ("Good and experienced men to guard the standard") 50 unarmoured pikemen and 200 shot with firearm, good 'rapiers'(!) and helmets. The only doppelsöldner were the 50 men specialy selected from the pikemen. Wintzenberger is a rare example of doppelsöldner armed with two handed swords. His Fähnlein of 300 men has 82 doppelsöldner with harness and pikes, 14 doppelsöldner with harness and "schlachtschwert", 18 halberdiers, 42 musketeers and 144 arquebusiers. According to Junghans von Olnitz a "Fähnlein" of 500 men should have 200 arquebusiers, 200 pikemen, 45 halberdiers, 45 men with boarspears and 10 men with "schlachtschwert". Another illustration of how few men were armed with two handed swords. I've yet to encounter a text describing the men armed with two handed swords being deployed in front of the pikemen for example, rather they were deployed inside the formation to protect the ensign and the flag he carried. Hence there was no need for larger numbers of men with that weapon as could be seen above. The Hauptmann stod in the middle of the 1st rank while the Leutnant stod in the last rank. On each side of the men with pikes, halberds and other melee weapons stod 23 ranks of men with firearms, each rank was 5 files wide. The first 4 ranks were made up of "doppel-schützen" i.e men armed with heavier firearms such as the musket or even heavier doppelhaken. 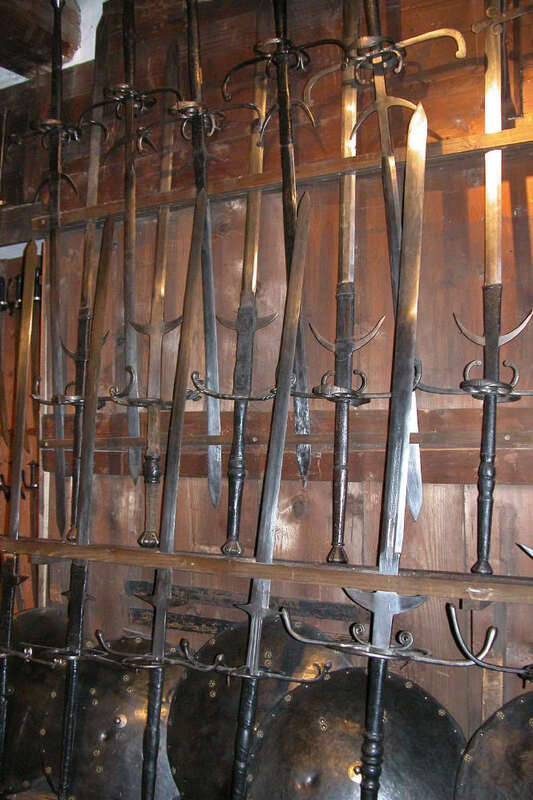 If you look at the photos of actual zweihänders/schlachtschwert in the Landeszeughaus in Graz you will find that they all have quite serviceable points. Will they thrust as well as a Type XVa or a Type XVIIIe? No but against their intended targets they will thrust just fine. It is exactly as Daniel above had stated, the myth of the two-hander being used in such a manner is essentially debunked. No period sources reveal such a use of this weapon. However, I do have a personal theory about its use, so take it as you may. This might also explain in part the origins of the famous myth. I personaly believe that the two-hander may had a more flexible role during the earlier part of the century. Their primary porpose was to guard the ensign, but depending on the number of these troops, the captain may be enticed to send some to "troubled" spots. For instance, to settle a melee that may had broken out on the border of the feahnlein, giving time for the dissordered troops to return in formation. The captain may also send such troops to enforce victory or to deter defeat. Against an enemy on the edge of breaking, one certainly can't deny the psychological effect such a shock weapon can serve on such key moments in battle. That being said, against a well ordered formation this tactic would have little value and is best left to the main arms of the formation to face. Had I been alone facing such a force as a wall of pikes, I would want nothing less then a cannon loaded with grapeshot, little else would work, a few swordsman would only end up as pin cushions. As I said before I meant this tactic is only really viable during the first half of the century. If you've noticed, the closer to the end of the century you get, the more formations relly on gunners, the fewer the alternate arms become. Guns become the main offence of a formation and pikemen serve a more defensive role, no longer the famous charge of pike like what the Swiss were famous for. As such, for a formation of 500 men or so, by this time there may be 10 or less two-handers present, halberdiers remain in plenty as they were for a while longer still the best multi-porpose polearm, and even they became more decorative, with the axe heads becoming less functional. All this following new trends in function and fashion I guess. No matter what the time frame though, there was never a need for many such swordsman. A dozen or so men would have been plenty for any of the above roles a captain would need them for. I have never seen any period artwork showing more than this anyways and the few pics backing my theory had only 2 or more/less men serving such a role. Just my thoughts on the subject , at least serving as brain food for future ideas. "During the middle ages, most infantry swords were relatively light and easy to wield, but by the late 15th century, a distinctive group of larger weapons grew in popularity, particularity in Germany. These two handed (doppelhander--doublehander or beidenhande--both-handder) swords were specialist weapons. The Landsknecht who used them were called doppelsoldener and received double pay; but they earned it. They were expected to hack their way into enemy pike units. The impressive but clumsy weapons were also used for ceremonial duties and executions." Shown as an example is a sword with a blunt point whose origin is German date 1550 and the caption says it is used to for hacking the way into enemy formations not pierce victims. A second source used in my hypothesis is THE GRAMMAR OF WARFARE. On page 166 Titled Infantry, it illustrates Landsknecht who it states were developed by Maximilian I as a counter to the Swiss Pike formations which then dominated Eropean warfare. The Landsknechts are shown in their puffed and slashed dress but armed with a variety of various weapons from arquebuses, halberds, and their doppelhander swords as well as regular sized swords. I think that one can say the two handed sword came in a variety of types with no one type predominating but the zeihander or doppelhander seems to catch ones imagination. History is not static but operates on a continuum which means change and evolution or sometimes repetition occasionally. National styles come into play as well as types of sword or uses of swords and tactics which means a confusing flux for we who are trying to interpret who used what, when, why, and how. I liked the photos and found your presentation quite interesting particular for my own edification. A significant minority of these Zweihänders have this kind of very square blunt tip; most have rather more pointy ones (but still broadish, nothing like a pointy longsword point). The tips of Zweihänders tend to be very thin, so I wonder how many of these square-tipped ones are square-tipped because the original point broke off. I don't see why a sword would be square-tipped just because it's intended to be used mostly for cutting. A broad triangular or rounded viking style tip would still be nice and thin for cutting, and would keep the option of thrusting open - potentially useful in battle. Of course, there were swords designed purely for cutting, with very square tips - execution swords - but those were not made for use in battle. Back to the other twin in this thread on using two-handers. As I said in a previous post, I was going to do some homework. I do a cut 3 stepping right followed by a cut 4 with a left step and again a cut 3 stepping right. The cut is to something like Langenort or Bicorno to form the thrust over the right arm which I give like a Schlüssel while stepping back with the right foot. When I put down my right foot I'm in a left Ochs (pommel in front of right shoulder) and I give the thrust stepping right to something like Hengenort. Dropping the point Schlüssellike only then I turn around to face the other direction and repeat the whole sequence. As I read the rule I do not think you should turn to give the thrusts, the description is very different from the 4c. What do you think? I do the same but now I'm going to try to do a convincing continuation of a circular cut but I still have to think and try a bit more on this. I have some plays of Godinho and Monte from the two handouts. I've figured them out, more or less, but I don't train them. My focus is on Figueyredo as I don't think I know this already well enough. But it is great material to compare and check what you're doing in Figueyredo. When the polishing is done I certainly want to read it. While im unfamiliar with your second source, I can tell you that the first book "Weapon" should be taken with a grain of salt. I own the book and it's sibling books and they are all made to be interconnected. Take for instance "Warrior" and look up Landsknecht under Renaissance. they tell various things about them and under their equipment section shows the very same sword you mentioned. However, the Landsknecht formations are shown as having two-hand swordsman scattered along the formations perimeter to meet enemy troops and break their stride. Now ask anyone who does Landsknecht reenactment and tried to pull off this tactic. They often find themselves overwhelmed by the number of enemy pikes and often got in the way of allied pikemen approaching from behind. This is where my theory shines, as while two-handers are not very effective against a fresh, well ordered pike formation, they have use against a weakened/broken formation or during all out melees or "bad-war" as its also called. All in all the Osprey book series as a whole are decent books, but they tend to be misleading or misinformed on various subjects. I would recommend looking into myArmoury's online book section,as the many books there are all good reads. I think the first and second rule, the simple as well as the complex, form a subset. The first simple is cutting diagonally upwards, the complex one is the same but thrown in is cutting vertically down and up. The second is cutting diagonally downwards, the complex one also with horizontal cuts from both sides. This means the eight directions and that's why I think they should all be done with a step for each cut. Ok, I can see your reasoning here. I agree the first set of simple and complex rules introduce basic cutting – the 1s and 2s introduce the 4 ‘universal’ cuts which are forehand (talho) and backhand (revez) from above and below – this simple distinction (left and right, from above or below) is very old, as old as the Hs.3227a housebook on Liechtenauer’s early art. It’s also obvious 1c introduces a largely vertical cut (the altibaxo), although it need not be perfectly vertical IMO (just more vertical than diagonal). What I’m not sure about is seeing horizontal cuts in 2s. I don’t have anything against it - with the mechanics I use, switching from a WMAC cut 1 (descending talho) to a 6 (horizontal revez) and then a 3 (rising talho) is very easy and fluid - as fluid as the other combinations I practice with 2s such as: cut 1-2-1 then 2-1-2 or 3-2-3 then 4-1-4 or 1-2-3 then 2-1-4 etc etc. Mind you, we’ve already touched on the amount of interpretative room in the rules, and the horizontal cut works nicely here, so there is no reason not to work with a horizontal cut in this rule as well - I will work with it some more. The second subset is the three ones following where you are taught thrusting and different transitions. The remarkable thing for me is the 4th complex: learning to turn a 180° which is done stepping backwards while thrusting. As you are cutting down from your right shoulder you could just swing through and turn around to your left with or without stepping or you could have stepped left additionally and turned around to your right ... and in both cases you could form a thrust. The transitions in this set are not only done as a full swing but also at shoulder level. It is an interesting play. We know it’s building from 3s and 4s – we now know how to prepare a thrust (from the terminus of a ‘half cut’ talho) over the right arm (bicep) into a “schlussel-like” position and deliver it (without stepping, just pivoting/uncoiling our body) to opponents in front of us. 4c could be showing us one way to turn and face a threat from the rear from our ‘schlussel’ preparation with the thrust charged – as we might have to do if we’ve just noticed an opponent approaching from the right, rear side in the peripheral vision of our right eye. Since the thrust has already been prepared over the right arm from a half cut, cutting through to the left before thrusting to the rear is not the most efficient option. Still lots to play with here. I think these two subsets form a set divided from the rest by the sixth rule which is against a montante and the complex one says as much as: if you know how to handle a montante you will know what to do. So the first five simple and complex are the basics. The 7th till the end are the "real" situational ones. Seems fairly plausible. I still think the first five rules are really useful in basic ‘real’ situations – they are the bread and butter of the montante – how to cut and thrust fluidly and continuously in any direction needed. And lots of fights are won with effective application of basic techniques! I do not consider driving forward or turning a 180° as situational in the first five. I’ll think on this – I think there are still situational uses, but even without those, these rules continue to operate as basic training and conditioning of the all important basic techniques. I also think that this second set could (should) be done from the left shoulder guard. More to chew on! Thanks. Thank you Eric and Steve for making this work freely available in English! It was a generous move. As Steve said, we purposely kept the interpretation out of that publication, but now I want to join in the conversation, so I'll chime in with a couple thoughts I've had on some of the topics you've brought up. Sorry I'm late to the conversation. No problem! I appreciate your insights. If I’m a little slow in between replies, it is because life is very hectic and time is very short at the moment. I do 2c with the same footwork Bill describes, but I think it is interesting that 2s is all cuts with steps, and the implication is that 2c is more difficult, perhaps because of that very lack of core body movement to assist the cuts, again in line with Bill's comments. That’s my thinking. 2c is complex precisely because it introduces new body dynamics with the existing 4 cuts. I’m going to chew more on whether it also introduces horizontal cuts, as suggested by Patrick. Agreed. It helps explain the utility of preparing the thrust on the arm from a ‘pulled’ half cut. Cuts to or through the centre: I try to use both of these, because no system is complete without both. Circular cuts are described a lot in period works, but the leverage of two hands let's you do things like disarm a single hand sword using your weak against their strong. How can you not love that? I choose to or through mostly based on what is happening next: if it's followed by a thrust, the cut is to the centre (though Matt Galas does a pretty convincing tight continuation of a circular cut to return the point towards the opponent); if you want to cleave the opponent in twain or force him to step the f*** backwards, it's a cut through the centre; any time you want to affect more than one opponent with a single cut, it's a cut through the centre. I largely agree with the important proviso that recovering and maintaining a threat is generally easier and swifter with a half cut rather than a full cut (at least, as I do them). In particular, against a single opponent, a proper half cut leaves less openings (sword remains right in front, presenting a threat and in place to parry) and avoids offering up a tempo for the opponent to exploit should the cut miss (when compared to a full cut, which usually takes the point offline during any recovery/preparation in between cuts). On the other hand, against multiple opponents, the ability to threaten more than one opponent at a time is a big tick in the column for fuller cuts. Absolutely. For this reason alone, I think the montante is fantastic cross-training and conditioning for other forms of double handed swordwork with shorter, lighter arms (such as longswords). Pollarm work is also great conditioning for shorter sword work (Meyer’s half staff is probably still my favourite weapon for working out). I haven’t done much work reversing the starting side even with the early rules. Mainly because the rules as written tend to begin from the right, and also because I think there is an (unspoken) recognition that striking from the stronger (usually right) side is most advantageous for the first blow in a fight – certainly, to cross reference (or pollute as the case may be!) from another tradition, Liechtenauer has us strike the first blow from our stronger (right) side first in order to avoid entering the fray in a weak position. The discussion here makes me wonder somewhat about one thing: how much material do we have on the two-handed sword in 18th- and 19th-century manuals outside the revival movement championed by Alfred Hutton and his associates? It'd be interesting to see what the masters and writers of the smallsword and epee eras had to say about this rather antiquated weapon. The only person in the 18th and 19th century of whom I know, who treats the two handed sword at all is Colombani in 1711, and gives a short section entitled: Regola di Spadone à due mano contro à più Spade. Or rules of the spadone of two hands against many swords. From the Iberian side, I do not think it is treated that late at all, other Italians, I don't know, most likely not. VEROLINI (Theodor). — Der Künstliche Fechter, oder des berühmten Fechtmeisters Theodori Verolini klare Beschreibung der freyen, ritterlichen und adelichen Kunst des Fechtens im Rappier, Düsacken, und Schwerdt wie dann auch mit angehängter Ring-Kunst; wie sich bei vorfallenden Gelegenheiten in allerley gebräuchlichen Wehren die angenehme Schüler zur Behendigkeit künstlich mögen abgericht, etc. Folio. 1679. Würzburg. I do a cut 3 stepping right followed by a cut 4 with a left step and again a cut 3 stepping right. The cut is to something like Langenort or Bicorno to form the thrust over the right arm which I give like a Schlüssel while stepping back with the right foot. Good thoughts, I'm going to try some things out thanks to your posts. For starters, I'm rethinking 4c - rather than giving a thrust behind ("to the rear") by turning with the thrust, I'm thinking of a straight thrust performed off the right arm, by removing the right foot, then turning to the right and cutting a revez with a left step to the place behind us... I actually prefer this as a simpler and faster response... More to chew on! The more I think on this, the more I agree with your take on 9c (and using the same approach for similar rules such as 4c) - give the thrust forward whilst passing the foot backward, then turn and cut from that position (4c) or thrust forward again (9c). I think stepping backwards with the thrust is totally valid against a single opponent, but it doesn't appeal to me against multiple attackers because it means backing up towards an opponent without the protection of your sword. Get some friends with single hand swords to surround you and try it. As soon as you turn around to start something in a new direction, they can close in on your back pretty fast! Good point. Although the risk, to some extent, can be handled. For example, after thrusting forward whilst passing the right foot backward, immediately turning180 degrees clockwise and preparing to cut, if we notice there are opponents closing in from this direction and they are too close, we can choose to revez whilst passing the right foot backward again (removing the body) rather than stepping forward. Mind you, this doesn't eliminate the moment of vulnerability while the thrust was delivered and the foot passing backward. So I take your point (no pun intended). Well yes, it can be mitigated that way, but then you are clearly not following rule 4c (in this case) since we are told next to move the left foot with the revez. I'm not against making up new rules or free form movement, but that is different than figuring out what Figueiredo said to do in a specific rule. At this point I'm not fully convinced this fits as a strict interpretation, but it's a nice combination of moves. (We practice variations based on rules too, in order to accommodate this sort of thing without getting to persnickety.) In 4c for example, it works nicely if the second talho is a cut through the centre which continues all the way around to bring the point forward again - this harnesses the movement of sword and body together quite smoothly for the step and thrust. I haven't had a chance to play around with Patrick's take on 9c yet. Well yes, it can be mitigated that way, but then you are clearly not following rule 4c (in this case) since we are told next to move the left foot with the revez. Yep, I know that. I was providing an alternate response to address the specific concern you described (i.e. use of a thrust with a pass back followed by a revez with a step forward in rule 4c when multiple opponents are close behind and able to threaten our back, making 4c risky). The original rule simply says it is good for fighting people in front and behind - nothing about how close or far away those people might be from the swordsman. IOW, in the right circumstances, thrusting with a right pass back, then turning and cutting a revez with a left step forward might be entirely appropriate if the people behind are far enough back. In different circumstances, as you said, those same actions may spell disaster (in which case, I speculated about stepping back with the revez, to allow more room rather than stepping forward). Any response will obviously depend entirely on the situation in the moment and the relative measure. It seems I drifted from discussing the specific rule to ways to apply that rule to other circumstances without being clear enough about it. In 4c for example, it works nicely if the second talho is a cut through the centre which continues all the way around to bring the point forward again - this harnesses the movement of sword and body together quite smoothly for the step and thrust. I haven't had a chance to play around with Patrick's take on 9c yet. This sounds very promising too. Keen to try it out.